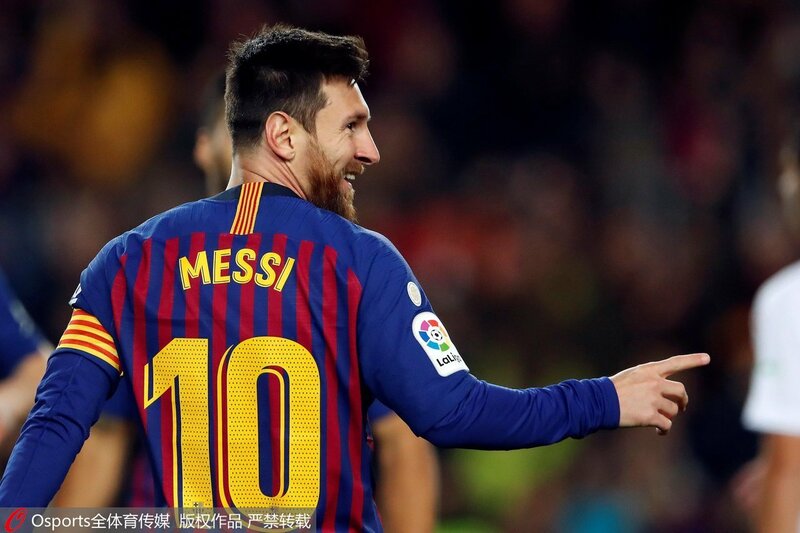 FC Barcelona's Argentinian striker Lionel Messi celebrates after scoring the 2-0 lead against SD Eibar during the Spanish La Liga Primera Division soccer match played at Camp Nou stadium in Barcelona, Spain, 13 January 2019. Leo Messi scored the 400th league goal to gift FC Barcelona the 'Winter Champions' in the Liga Santander with a 3-0 win over Eibar at home on Sunday. Messi netted Barca's second of the night after Luis Suarez had opened the scoring in the first half and Suarez rounded off the scoring shortly afterwards to confirm, not just Barca's win, but also to ensure they reach the midway point of the season with a five point lead over second placed Atletico Madrid. Earlier in the day, Antoine Griezmann's 57th minute penalty after the VAR controversially decreed there had been a deliberate handball in the Levante penalty area, was enough to give Atletico a typical win against the Valencia-based side in the Wanda Metropolitano Stadium on Sunday. Athletic Club Bilbao striker Inaki Williams hadn't scored a league goal in Athletic's San Mames Stadium in over two years (770 days), but then proved that, like buses, goals never gone one at a time. Williams scored two superb individual goals to give Athletic a 2-0 win at home to Sevilla, a result which dents Sevilla's title hopes and lifts Athletic clear of the relegation zone. Real Madrid coach Santiago Solari switched to a system with three central defenders for his side's visit to Betis and was rewarded with a 2-1 win, which came with a big slice of luck. Former Betis hero Dani Ceballos scored the winning goal two minutes from time with a free kick, which both the defensive wall and Betis keeper Pau Lopez should dealt with. However, Madrid also deserve credit for battling through despite a serve injury crisis which was made worse when Karmin Benzema had to leave the game after dislocating a finger. Saturday saw Getafe's excellent season continue with a 2-1 win away to struggling Villarreal. Veteran striker Jorge Molina opened the scoring for Getafe, but Villarreal drew level 15 minutes from time with a Leandro Cabrera's own goal. Angel Rodriguez's 89th minute goal sealed the win for Getafe, but not before drama in injury time when Villarreal twice hit the woodwork through Ramiro Funes Mori and Karl Toko Ekambi. The home side were then awarded a penalty only for Ekambi to fire over the bar. Borja Baston's goal early in the second half saw the points shared between Girona and Alaves. Cristhian Stuani's overhead kick put Girona ahead before the break, but in the 50th minute Baston latched onto a deflection to fire home from close range. Valencia's struggles continue after Ruben Alcaraz's brilliant free kick 8 minutes from time gave Valladolid a point in the Mestalla Stadium. Under pressure Valencia coach Marcelino Garcia Toral saw how Rodrigo Moreno missed a penalty before Dani Parejo's 72nd minute penalty looked to have given his side a much-needed win, but Alcaraz's spectacular strike condemned Valencia to their 11th draw of the campaign. On Friday Rayo Vallecano made it 3 straight wins with a 4-2 victory at home to Celta Vigo thanks to Raul de Tomas' hat-trick.